Wilfred MORTON On 10 Sept 1914 at age 32, Wilfred was sent to Europe as part of the 4th, 11th & 12th Field Ambulance where he quickly rose up the ranks from Private to L/Corporal to Corporal then to L/Sergeant and finally Sergeant. After brief training in Egypt, he went to Gallipoli with the Mediterannean Expeditionary Forces (M.E.F) as part of the 10th Australian Light Horse Regiment. On the 25th they arrived in the waters off Gallipoli, most soldiers went up to the deck to have a look with their blankets wrapped around them. Being around midnight they couldn’t even see a ship a hundred yards away, but an outline of the shore could just be made out. Wasting no time, 60 war ships opened fire on Cape Halles. It was just like a light had been turned on, everything lit up like it was daytime. The Queen Elizabeth, the biggest ship in the British Navy was only a hundred yards away and everytime she fired her big guns, directed at Sedd el Bahr Fort, Wilfred’s entire ship would shake like an earthquake. They stayed on deck watching until dawn when the troops from the other ships started piling into the barges, all standing up for the brief trip to the shore. After seeing the cliffs and terrain on shore and with their 500 horses on board and 250 men, it was decided that horses could not be taken ashore at this stage and so they watched the entire landing unfold in front of their eyes, although the skipper of their boat was a foreigner and he liked to be right out the front closer to shore. The men on deck could see the bayonets flashing as the men on shore cleared the scrub where they landed. At one point a shell from the Sedd el Bahr Fort landed about 20 yards from the boat and splashed the entire boat in a wave of water. The old Skipper didn’t even wait for the anchor to come up, he started moving the boat while it was still coming up. 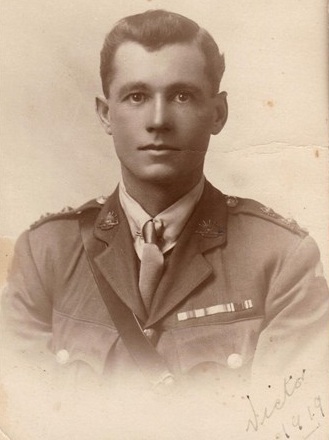 After Gallipoli, Wilfred was then sent to Maadi in Egypt via Alexandria, transferring to the 12th Field Ambulance regiment at Tel-el-Kebir where 40,000 Aussies had constructed a tent city that extended six miles in length. During his 3 months at Tel-el-Kebir he came down with a case of tonsilitis but was soon fit and fighting again. In June 1916 after being promoted to Lance Corporal, his unit joined the British Expeditionary Forces (B.E.F.) in Marseilles, France, where upon they headed north towards Belgium by rail. In October1916 he was given medical treatment for defective vision most probably due to Mustard Gas and also suffered from Bronchial Catarrh but was back on duty within 8 days. In November they were in Pozieres in northern France before marching to Eu on the coast. Later in Poperinge, just over the Belgian border, one of the regiment, fell in love with a local girl. He couldn’t speak French and she couldn’t speak English. One of the other soldiers could speak French and would have to act as interpreter of their love. 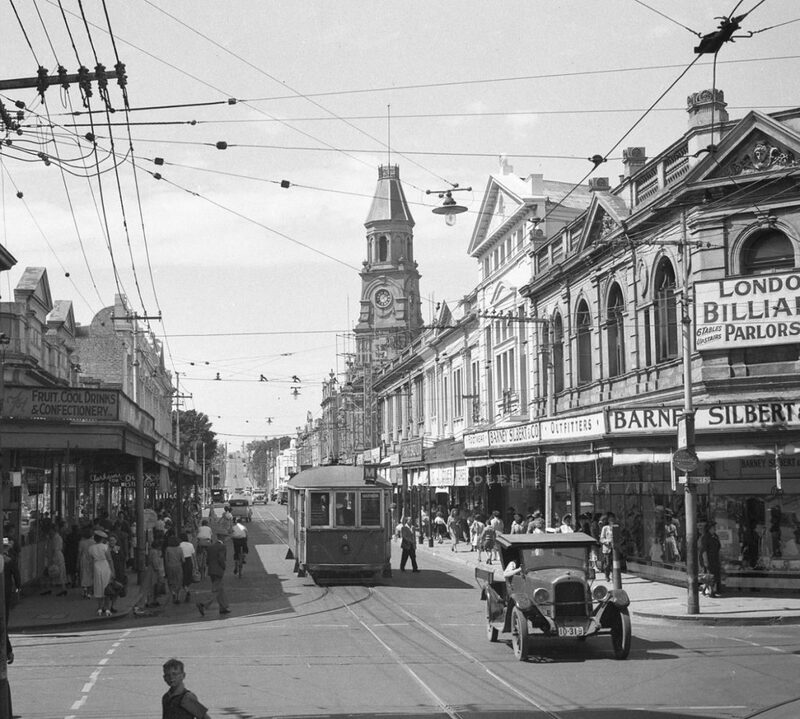 in Baillieul they stayed for a length of time and a local woman, Veronique, would let them use her stoves to cook their food, in return the Aussies would give her all their cheese rations (10 pounds a day) and would even post it to her later on in a four gallon drum. Only 4 months after being appointed Lieutenant Sergeant in March 1917 he was promoted to Sergeant. In October 1917 he was sent to hospital at Remy in France with a wounded right thigh showing Myositis Ossification, which is the calcification of muscle, usually caused by premature return to activity after injury to the affected area. It is not known what caused the initial injury. He was eventually sent from Rouen, France to a hospital in England for treatment. He then reported to Hurdcott, England in November before finally being sent back to France in February 1918 to the Australian General Base Depot (A.G.B.D.) at Rouelles. He was then temporarily dispatched to work at the Vety Hospital in Calais before heading to Folkestone in England and finally returning home to Australia on 24 August 1918 for Submarine Guard Duty. Wilfred received the 1914/1915 Star, Victory and British War Medals and was reunited with his wife Arabel and daughter Zela. My Grandmother Judy was born a few years after the war. 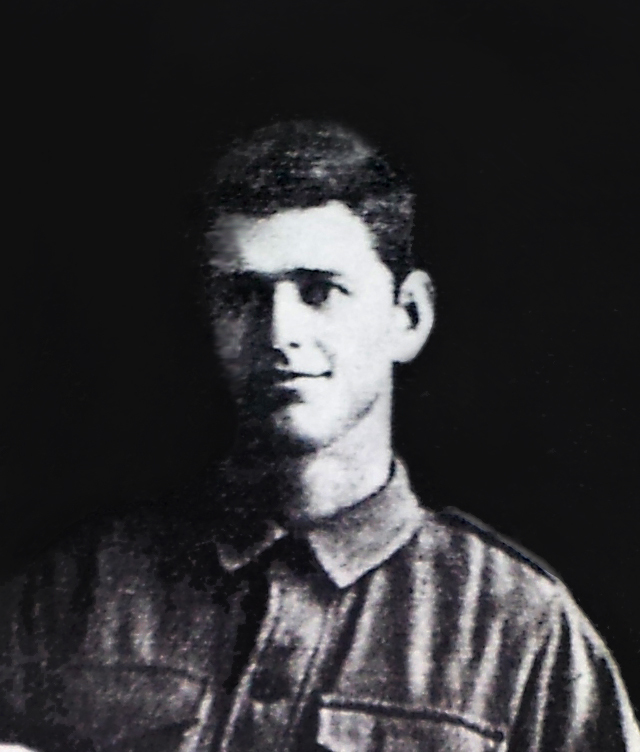 Victor MORTON enlisted with the Australian Imperial Forces on 22 Sept 1914 as a Driver in the 3rd Light Horse Field Ambulance. At 24 years of age he’d previously been working as a farmer. On 26 February 1915, they embarked on the ship Chilka, as part of the regiment’s ‘A’ Squadron and headed on a month long voyage for Egypt where many ANZACs received their first war training. The 3rd Light Horse didn’t have time for that and were immediately dispatched to the Dardanelles where they were part of the 3rd Australian Brigade; the first to charge the shores at Gallipoli. Over the next two years he and his comrades fought in various desert battles around Gaza, Jordan, Jerusalem, Jericho and the Sinai Peninsula before heading to France in 1918.During this time he was promoted to Lieutenant. Here in France on 4 July, at the Battle of Hamel, a successful attack was launched by the Australian Corps and several American units against German positions in and around the town in northern France. The battle was the first time in the war that American troops participated in an offensive action under non-American command being led by Australian Lt Gen John Monash. All the allies’ objectives were achieved in 93 minutes of actual battle time using (then) modern military tactics involving combined arms and advanced coordination between infantry, artillery and armour. Conventional tactics would have seen them there for months. 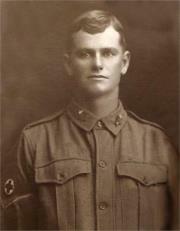 “Identification was urgently needed and this Officer (Victor Morton) with eight men left our lines to secure prisoners. Having proceeded about 700 yards across NO MANS LAND a party of 30 of the enemy was observed working on a new trench. Quickly forming his plan of attack this Officer led his men to the flank of the enemy party to secure the greatest fire effect. On a pre-arranged signal the covering party opened fire, and he, with his Sergeant, rushed the nearest Hun, seized him by each arm and brought him to our lines. The operation was so vigorously carried out that it was completely successful. Casualties were inflicted on the enemy and our patrol was unscathed. The war ended just a few months later but Victor didn’t return to Australia until 25 July 1919, nearly nine months after the end of the War. He married his sweetheart Lillian Thompson the following year and they had one son, Kelvin. Alan MORTON was just shy of 28 years when he enlisted in WW1 on 2 August 1915, having previously worked in a timber mill. In December 1915 he disembarked at Suez and immediately joined the Mediterranean Expeditionary Forces who left Egypt a few months later in March 1916 for Marseilles, France where he joined the British Expeditionary Forces. He very quickly was promoted to Corporal and two days later to Sergeant. At Rouen, like many others, he contracted Influenza and was admitted to hospital, but was fortunate to survive where many did not. For the rest of the year he was situated entirely in France. While fighting at Etaples he was caught in the dreaded Mustard Gas and was briefly hospitalized in October 1917. Alan was promoted to Lieutenant just a month later and transferred to the 1st Division Artillery. He returned to Australia in February 1919 reuniting with his wife Laura and three children who were all under the age of 5 when he first left Australia. Another 5 years had passed for him to see them again. Alan passed away on 23 March 1970 in Esperance, Western Australia. Lovely stories! And Wow! two MCs in the one family!